I mentioned recently that I would have a short story for my Kobalos Trilogy available for purchase in e-book format. That is now the case. 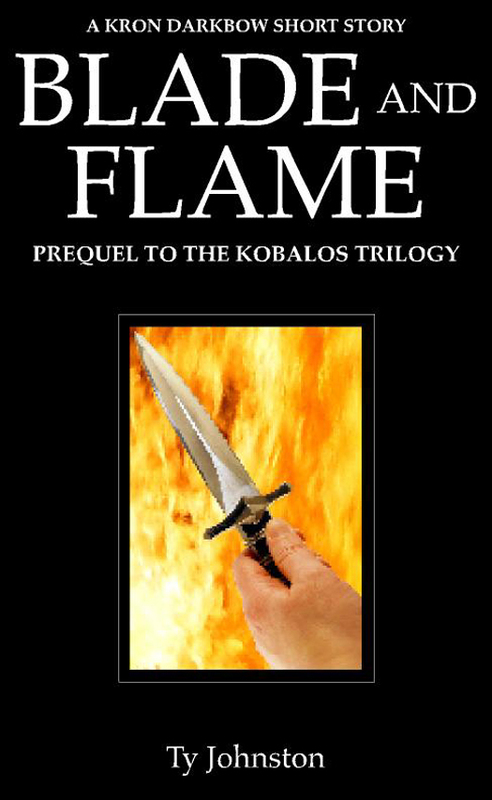 The story is titled Flame and Blade, it's right at 11,000 words in length and costs 99 cents. Also, a word of warning: For anyone who has not read my Kobalos Trilogy, specifically the first novel City of Rogues, there are a few SPOILERS to be found in Flame and Blade. Just wanted to let you know. Okay, everybody is shopping for Christmas and looking to save some dough. So, I thought I'd do my part to help readers and potential readers save a little money. Through the remainder of the holiday season, which means through January 2, my literary novel More Than Kin will be available in digital format for only 99 cents. For you Kindle readers, check out the image and link at the right. For you Nook readers, follow this link. For those with another type of e-reading device or who read on their computer, I suggest you go to Smashwords for the novel. And here's a brief description of More Than Kin: Walt Johnson has been a rolling stone most of his life, moving from town to town and living on the edges of homelessness. Now he has run out of time as lung cancer has left him only months to live. Walt then begins a quest to find the son with whom he lost contact decades earlier. Out of money, he gets a job at a small-town restaurant in an attempt to save enough to buy a bus ticket to finhis son. Digital publishing is obviously bringing major changes to the business end of fiction writing, but one thing I've not seen a lot of yet is experimentation with the structures and formatting of fiction. What I mean is that, in the future, stories might often be told quite differently than in the traditional prose structure. Some publishers are already looking into and experimenting with e-books that go beyond the norm, that include videos and links and all kinds of stuff. But that's not exactly what I'm talking about. A screenplay is about the best modern example that comes to my mind, though possibly also scripts for plays or even comic books. Would there be a sales potential in these forms of writing? Probably not much of one right now, but as more and more readers become accustomed to digital reading and more and more writers begin to experiment, I think a lot of things are going to change. As writers, our dramatic options have been opened up big time. Most of us just haven't realized it yet. Take for example, video games. If you're an older fan of video games, such as myself, you can remember back in the day when Pong was about the only video game available to play in arcades, other than maybe Sea Wolf. Then along came Space Invaders, and soon after that Pac-Man, and everything changed. For younger gamers, the same sort of thing happened nearly a decade back when Grand Theft Auto 3 became available; the video game world has not been the same since. I'm predicting something like that will happen with writers and e-books. Traditional prose novels will always be around, I figure, but I think there'll slowly begin to be more room for more experimental literature and experimental formatting and story structure. Many writers are already noticing that digital publishing is giving them more freedom when it comes to length. Now, a novel doesn't have to be somewhere between 70,000 and 120,000 words to fit with print technology and readers' expectations. A novel can be broken up into several different novellas, sold separately. A novel can be sold by chapters. Or a novel can be 300,000 words long and sold as one great big package. More creativity will flow. Writers will begin to figure out other options, new ways to telling stories. What got me to thinking about this is because I'm already planning on doing something similar for the coming year. I was pondering a blog post about expectations for next year when this hit me. Currently I'm working on a trilogy of novellas, which is in itself somewhat unusual and experimental, but I'm also planning a project that's a bit different. How different? Probably not massively different, but something that's written for today's audiences, something written for those with shorter attention spans who often read on tiny little screens. A novel written in a flash format? Not exactly, but maybe something like that. I still don't have all the logistics worked out. But it'll be a fast action story told in short bursts, with short chapters and side chapters and ... whatever comes to mind. It was my thinking about how scripts are written for video games that got me considering the idea, not that I'm going to write and release a game script. But I've the novella trilogy to finish. And I do have other plans for 2011. We'll see where it leads. ... and I can think of someone who needs help right now. April Hamilton, who runs the Publetariat site for and about indie authors, is in dire straits. I won't go into all the details since she does enough of that on her site, but if you can donate even a dollar, it would be of help to this woman who is struggling. Publetariat has been a huge help to many beginning indie authors, so if you're one of them, please keep April and her family in your thoughts this holiday season. Donate by going to this link. Writers are whores. I've heard it said probably a thousand times, usually by writers. I've decided to join that crowd, sort of. No, I'm not ghost writing or joining the legions of writers who pen media-tie-in novels. I've not sunk that low yet. Okay, okay, I take that back. Some media-tie-in novels are pretty darn good, and it's a great way for many fiction writers to make a living while also gaining experience. No, I've decided to whore myself in another way. My Kobalos Trilogy is my best-selling e-books of all my e-books. In fact, I'm feeding my family and paying the bills on those three e-books. I think part of what draws fantasy readers to my series is that I only charge 99 cents for the first novel, but then I charge $2.99 for books two and three. I'd really like to charge more for that first novel because ... well, it's a novel. And I'd kind of like to make more money from it, to be blunt about it. The few times I've temporarily raised the price on that first novel, my sales start to plummet right away. So, I've got this idea. I wrote an 11,000 word short story a while back that is a prequel to the Kobalos Trilogy. My thinking is that I'll put up the short story for 99 cents, see how well it does, and if it does really well then I can raise the price to the first novel in the series. If it flops, well, then I've not lost anything. The cover I'll be using for the short story is up top at the right. I've just a few minutes ago started editing the first draft of the tale, so hopefully I'll be finished with it and ready to upload it within the next day or two. I'm not the biggest Michael Buble fan in the world. He's a cool cat and an excellent singer, but I'm more of a rock guy. Still, when the wife showed me this video, I knew I just had to post it. Even if Buble's music isn't your thing, watch this video all the way through. It's quite astonishing, and fun. Okay, I've decided to change the name of my blog to make it a little more friendly to the casual reader. My old title, "Logical Misanthropy," was just fine 5 years ago when this was pretty much just a personal blog. But that ship has sailed. Readers and writers are starting to come to this blog, and I don't want anyone to be turned away by what they might consider an unfriendly blog title. Also, the search engines keep sending me people looking up the word "misanthropy," and I feel that's a disservice to them as this blog really has nothing to do with hatred of mankind. Okay, well, not most of the time. So, I need a new title. Temporarily, I'm just slapping up some kind of title. Heck, I might even have fun with it and change it from time to time, at least until I settle on something for good. I need suggestions for blog titles. I don't want something completely generic, but at the same time I don't want something so obscure that no one will understand it. I need something that will be a draw to readers and potential readers. Notes: Yes, I've said before and I'll say again that I hate Charles Dickens. I think his plots are strong and his characters iconic, but I cannot stand his prose. However, my other half wanted us to read this book together and I agreed to do it. Why not? I've not read any Dickens in a long, long while, so I'll give him another chance. And it's an excuse to read another novel on my new Kindle. Maybe I'll actually even enjoy myself. Whipped! Mini review: For the most part, my opinion of Dickens' writing still remains. He has good characters and strong plots, but I cannot stand his prose. That being said, the ending to this novel was fantastic, truly historic in its own way. 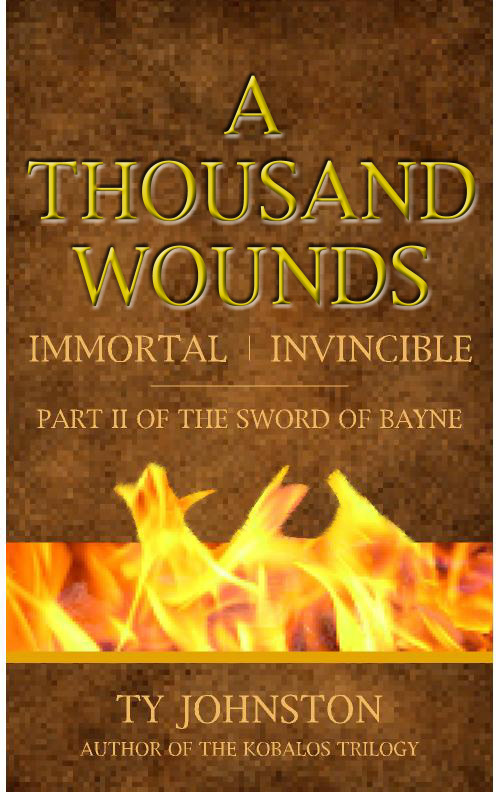 My current writing project is titled A Thousand Wounds: Part II of The Sword of Bayne. It's the sequel to my novella Bayne's Climb: Part I of The Sword of Bayne . A Thousand Wounds is another novella, and it's also somewhat experimental. What I'm attempting to do with this novella is to re-create some of the fantasy from the 1960s that was somewhat unusual, almost with a science fiction touch, that focused upon traditional fantasy characters finding themselves in a "duck out of water" situation or world, strange worlds that offer technology, philosophies and peoples different from the traditional fantasy worlds. This was almost a sub-genre of fantasy for about a decade, but it seems to have died off by the 1970s and I've seen none of it since, though perhaps I've just not read enough. And genres like cyber punk and science fantasy aren't the same thing. Authors who worked in this unusual fantasy sort-of-sub-genre were Mervyn Peak, Andre Norton, and Jack Vance. The likes of Michael Moorcock even touched on the edges of this material, though his work tended to be more dark than that which I'm striving for. Another interesting thing, at least to me, is that this Bayne series does tie in with my Kobalos Trilogy, though not directly. It's the same world, only nearly 2,000 years earlier. Also, I have big, long-range plans for the characters and world within my Kobalos Trilogy, and the Bayne character's history will eventually play a more important role. How big are my dreams for my fantasy world? I'm not talking about a series of 12 or 13 fantasy novels, like Robert Jordan or similar authors. No, my goals are nothing so small. I'm talking about a series of 12 to 15 trilogies. Of which I've only completed one, The Kobalos Trilogy , and that trilogy actually takes place in the middle of the overall story. Of course I'm at work on the Bayne trilogy, which is a trilogy of novellas instead of novels. And I'm almost finished with the first draft of the second novella, A Thousand Wounds. Check out the image at right to see the possible cover for A Thousand Wounds. By the way, the third novella in the Bayne trilogy is titled Under the Mountain. Notes: I couldn't help myself. I read so much of the Malazan series this past year, I just had to read the next installment. One big reason for this is because I've caught up to everything I head read before, so this book is all new material for me. I'm really looking forward to it. This is definitely my favorite modern epic fantasy series, at least until I find another, which I find doubtful. Mini review: I honestly didn't expect to finish this one this year, but I managed. Anyway, this series has been accused of having too many characters and too many plots and sub-plots and of the author using deus ex machina too often, and I never really felt that until this book. At more than 1,200 pages, for the first time in this series, I truly felt it could have lost a bunch of pages, at least 300. And I finally got what some complainants meant by the deus ex machina because there were a few situations in the end where the "saving grace" was a little out of the blue, at least for the overall series if not for this one particular novel (ie. characters who had never been around before suddenly showing up in this particular novel to save the day in the end ... then only to disappear in one fashion or another). But, that being said, the payoff in the end makes up for a lot. This is still the best fantasy series I've read in a long time, and I'm looking forward to reading the next book. Notes: I've actually had this e-book for some little while now, but I've been holding off reading it because I expected to get a Kindle comes this Christmas. Well, Christmas came a little early this year, so I decided it was time to get reading. So, yeah, this is my first e-book read on my new Kindle. I've heard great things about this author and his Half-Orc series, of which this e-book is the first book, and I even interviewed him a while back. I love trying out new writers, and giving indie authors a shot. Here goes. Mini review: A nice read. Well written with very, very few copy editing errors, which is uncommon for many indie books. The characters I loved, and found them quite interesting. If I have any complaints about this novel, there are two. First, this has been called a dark fantasy by various reviewers, even the author. I have to disagree, but that's just my opinion. There are many awful things that happen in this novel, a good number of them committed by the protagonists, but they were not dwelt upon for any length. To me, "dark" literature is fiction that explores the emotional, even possibly spiritual depths, of human depravity, possibly even evil. I didn't feel that here. Others might. Again, just my opinion. My second possible complaint about this novel would be the characters' motivations; frankly, I didn't feel they were explored nearly enough. As an example, if a character is willing to slaughter innocents, unless that character happens to be a true unfeeling psychopath, there needs to be very strong reasons why such a character would be willing to do such. I didn't think that was here. In other words, I would have liked to have seen much more of the two main characters' past. As is, to me it sort of felt like, "boo hoo, we were picked on as little kids, so now we're going to kill everyone ... but we still love each other." That rang false to me. All that being said, I definitely enjoyed this fantasy novel and will be reading more from this author. And despite my faults with what I felt was lack of motivation for the characters, I still liked the characters quite a bit and would enjoy reading more about them.